I paint as a way of exploring the spiritual qualities of lived life. It is an intuitive process that is informed by experience, research, and journaling. I tend to work in series; each exploring an idea that comes to completion when the underlying questions have been resolved and/or another question becomes more compelling. For the past six years I have been working on a series called Above & Below. I am especially curious about different ways of seeing the world and am intrigued by the unfamiliar (encountered through travel and in art), extinct communities (such as in the cave paintings found in France & Spain), and indigenous cultures. 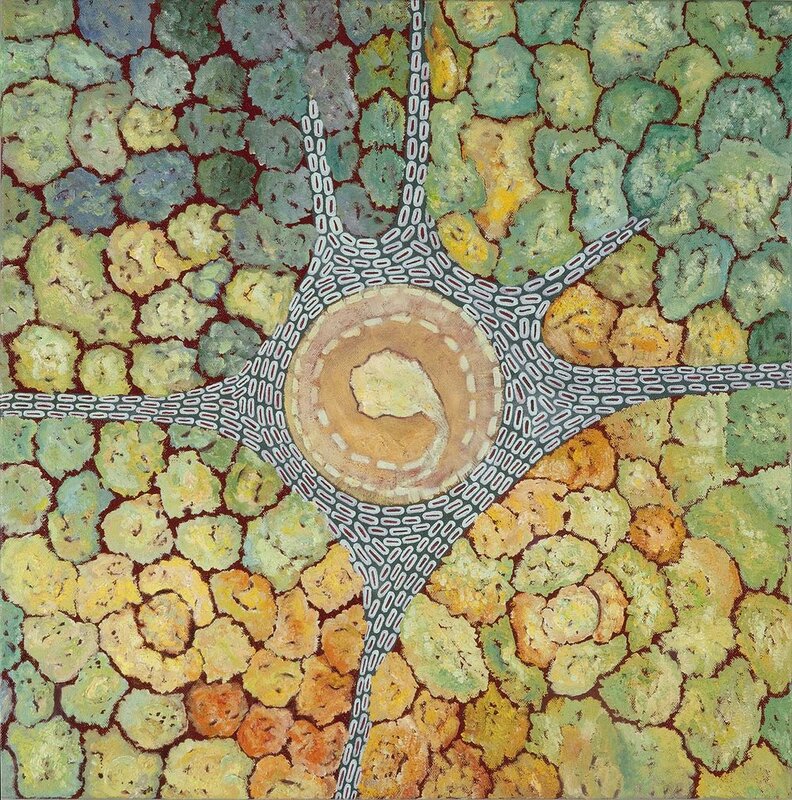 This series of paintings is inspired by the work of Australian Aboriginal artists and Indian mandalas, but it began through the rather mundane experience of getting lost on back-road ronds-points in France. I began thinking about the way we structure the experience of getting from one place to another. The circular pathways of a roundabout are quite different cultural modalities of disorientation and reorientation than an intersection controlled by a stoplight. The paintings in this series are based on aerial photographs of actual places, often indicated or suggested by the titles, but like Peruvian Nazca lines in their time, these are the markings of contemporary life on earth, whose purpose in some other time may be as mysterious as the Nazca lines are to us today. The aerial photograph becomes the underlying structure of the composition. The painting process is intuitive and meditative. PACIA SALLOMI is a Professor of Art at Carroll University in Waukesha, Wisconsin, where she has taught since 1997. Her courses range from all levels of painting and drawing to international courses such as: Travel Writing and Sketching in Italy. During her time in New Mexico, Pacia studied photography and Japanese porcelain throwing techniques at the University of New Mexico in Albuquerque, eventually receiving an MA in Art Education. She took her first painting class at UNM with Martin Facey who introduced her to the spiritual inquiry of color. She received her MFA in Studio Arts with an emphasis in painting and photography at Texas Tech University in 1997. Pacia’s work has been exhibited nationally and internationally in over 90 exhibitions including shows juried by curators from the Metropolitan Museum of Art in New York City and the Museum of Contemporary Art in Chicago. Her paintings have been exhibited in museums in Toulouse, France; Saitama, Japan; Milwaukee and West Bend, Wisconsin. She has been published in books and journals including: Et Pour Toi, C’est Quoi l’Art ?, Seasons of Change, and CALYX. She has created front/back book cover designs for Sundered and Shield/Le Bouclier. The later is a collaborative book of Pacia’s paintings and Phyllis Stowell’s poetry that was published in January 2007 as a bilingual limited edition artist’s book. The French translation is by Gallimard poet-translator of Emily Dickinson, Claire Malroux. Shield is included in the Morrison Library Reserve Collections at UC Berkeley and in the Franklin Furnace Artist Book Collection at MOMA in New York City. On September 11, 2001 her sound installation, In One Voice, was exhibited for the first time. This work involves the interweaving of 12 translations of a 5,000 year-old Assyrian prayer to the goddess Ishtar. It begins with the voice of an Iraqi man speaking in Arabic and ends with the voice of an American woman. The prayer is a plea to bring together our scattered clans and to bring peace. It is in the 911 Museum Digital Archives. Martin Facey, my first painting professor at the University of New Mexico, showed me that as a black and white photographer I missed the enormously large world of paint and color. I fell in love with oil paint then. No single artist directly influences the work I am doing but many inspire me in what it means to do the work and Martin is definitely one of them. As I now understand the term, I was always an artist, but I didn’t consider myself one until after I finished my MFA program. So in a way, it was after that initiation into the dialogue with the history of artists and artworks that I considered myself an artist. However, I don’t think it is necessary to get traditional academic training to be an artist and in some ways, what you learn there, has to be unlearned to find your own work. It’s all a process, whatever path your life-work takes. I’m sorry to be so vague here, but living life fully and with an open mind is the inspiration for my work. Being curious. Travel. Walking in my neighborhood. I had a Brownie camera as a young girl but I no longer have the camera or any of those photographs. The first oil painting I made was a still life when I was about fifteen. There was a blue Venetian vase, bowl and grapes. I was trying to make it look realistic and was really frustrated. I had never taken a drawing or painting class, I just set this up at home, where my mom also painted. I wanted to throw it away, but my mom thought it was a really good start. She worked on it a bit and made it more abstract and beautiful. It hung in her house for years and recently she, reluctantly, let me hang it in mine. I never imagined that I would become a painter. Never. There are missed opportunities I wish I would have taken. One was missed because I didn’t know I was even interested in painting at the time. I was a student at the University of California-Davis, studying Nutrition, doing ceramics at the Silo, a student organization, for fun. Years later, after I began painting and studying art seriously (ceramics, painting, photography), I realized that Robert Arneson and Wayne Thiebaud both taught in the art department at UCD – I have often wondered how my life path would have been different if I had wandered onto that side of campus. The second opportunity I missed was when I was studying photography and ceramics at the University of New Mexico. A fellow graduate student was going to a weekend workshop up in Taos with Laurie Anderson. There would be twelve people at this workshop and one of her friends couldn’t go. She asked me if I wanted to go and I said I couldn’t because at the time I was a single parent of two small children. I thought I couldn’t leave them for a whole weekend. They would have been fine. It would have been life-changing to have attended that workshop. And there were others. That’s what happens in hindsight. Making art is not a career-path, it is a passion. It is a pathway towards living a meaningful life. Don’t let career or job decisions alter your need, desire, and passion to make art and to find yourself as an artist. Stay curious. Absolutely everything you do in life is part of learning about being an artist. And being human. No. I was a licensed midwife in New Mexico and an articles editor for Mothering Magazine in the 80s and 90s. The experience of helping families with natural childbirth at home, and my work to legalize midwifery, has definitely influenced how I experience painting. Not generally, no. Because the process of making a painting is personal and develops on many levels so I prefer to not have comments on it until I feel it is finished. I do practice meditation, but in terms of artistic routines, I wish I could say that I did. During a trip to New York in 2009 I saw two exhibitions that eventually led to the series that will be on display; one was at the Ruben Museum – an exhibition of Tibetan Mandalas, along with Carl Jung’s Red Book, which had recently been published. The second was Australian Aboriginal painting at NYU's Grey Gallery. I also traveled to the Northern Territories in Australia, spending some time at an Aboriginal community art center as well as many other important sites. I have been primarily working on this series ever since. My interest in painting as a contemplative art form is the primary thing that motivates my work in terms of materials, processes and content. I still enjoy taking photographs as an exercise in framing the world, but they don't hold my attention as long as painting does. Process cannot be separated from the content of the work, it builds the structure of the painting, and it infuses it with meaning and feeling. There are basic elements like design and structure that become unified at the end of a painting, but primarily, knowing when a painting is finished is intuitive. There are many times when years later, I come back to a painting that I thought was finished and work into it again, sometimes radically changing it. So when is a painting completed? I don't know. It is how I process what it means to be alive, to be human, in this particular place and time. It calms me in a world that is at times chaotic and incomprehensible; it allows me to touch those places in myself as well and in this way, it is healing. There are many different approaches to art, and they have different roles in society. If I were to generalize, I would say that artists—be they painters, musicians, writers, actors—spend a good amount of time outside looking in, and inside looking out and thus help us to reflect on the way things are. It is a grave mistake to not hold the arts as a central part of education. The arts are not decoration to our life. They are the nutriment, the blood that pumps through our heart and connects us to each other and to our ancestors. We can survive without them, but we cannot thrive. There are many ways to support the arts. The most important way is to understand its value and to express that value through your actions in the world. This question always initially points to financial support for art institutions. But if we raise children to believe that art is superfluous, something we do “on the side” of the important things in life, if there is time, and from a cart pushed into our classroom once a week—we will have a society that does not fundamentally understand the importance of artistic insight in the formation of a civilized society.